A still from M. Night Shyamalan's trailer for "Glass." Caution: This article contains major spoilers for Split and Unbreakable, and minor ones for Glass. 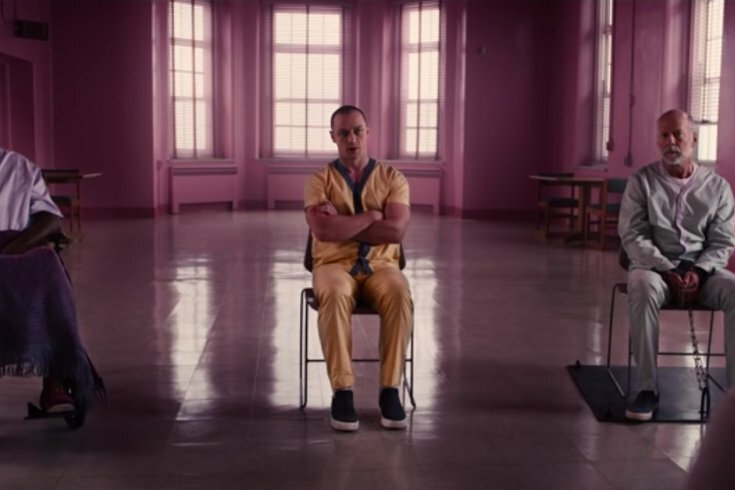 Split, M. Night Shyamalan's film from 2016 that was the local filmmaker's biggest hit in years, ended with a pair of the writer/director's trademark twists. First, it was revealed that the spot where most of the film's action had taken place was in fact under the Philadelphia Zoo. Then, in the final scene, Bruce Willis shows up, as we learn that that film was set in the same universe as Shyamalan's 2000 movie, Unbreakable. Now, nearly exactly three years later, we have Glass, which is a rare shared sequel to both Unbreakable and Split. The film, which opens Friday, filmed around Philadelphia in late 2017 and early 2018, with a side trip to Allentown. Local agency Heery Loftus Casting did all the extras casting for the film, and if you live in the area there's a good chance you know someone who was an extra. Both Creed II and Kevin Hart's The Upside recently arrived in theaters after shooting in Philadelphia, although there was much less Philly in the second Creed than the first, and Hart's hometown was barely glimpsed at all in the New York-set film that opened a week ago. Compared to those two films, there's much more in terms of recognizable Philly locations in Glass, even if most of the film is set indoors. • The "Ravenhill Memorial Hospital" is where most of the film's action takes place. The exterior of the building is actually the Allentown State Hospital, although the location is shown on an online map in the film as somewhere in Fairmount Park, east of the Schuylkill River. The Center City skyline, at various times in Glass, can be seen directly downhill from where the hospital is. • 30th Street Station, both the inside and outside, is featured in a key scene, as it was in Unbreakable. And while there's no zoo this time, Anna Taylor-Joy, reprising her character from Split, is seen wearing a Philadelphia Zoo jacket. • The film, through several pieces of news footage featuring CBS 3's Ukee Washington, establishes that the fictional "Osaka Tower," newly built in Center City, is now the tallest building in the world. The building seems to be further west than either of the Comcast skyscrapers and also taller, which is ironic, given that Universal Pictures, which released Glass, is owned by Comcast. The Japanese name of the building is also likely a nod to Nakatomi Plaza, the site of the action in a certain other iconic Bruce Willis movie. • Two Philadelphia comic book stores were used as locations- the Ontario Street Comic Book Shop, in the Kensington/Port Richmond area, and Brave New Worlds on North 2nd St. The Ontario Street shop was also featured in Unbreakable. • There's also an outdoor scene in an unnamed industrial area of the city that looks to be somewhere around Kensington, although the film refers to it multiple times as "the factory area," a term not generally used for any part of Philadelphia. • Parc, the Stephen Starr restaurant on Rittenhouse Square, can be glimpsed in one scene. Both Parc itself and Stephen Starr Restaurants are thanked in the film's credits; Shyamalan famously used Striped Bass, the now-defunct Starr restaurant, for a scene in The Sixth Sense. • And finally, we get another look at the train crash from Unbreakable, the "Eastrail 177," which derailed somewhere between Trenton and Philadelphia. We won't reveal too much about the plot of Glass, except to say that you're going to see multiple characters from both Unbreakable and Split, and yes, there are some of M. Night's trademark shocking twists. While Shyamalan's career has had its ups and downs since he burst on the scene with The Sixth Sense 20 years ago, Philly has always been in his corner. He even appeared at a live Q&A at the Kimmel Center in the summer of 2013, the absolute nadir of his career, and was cheered throughout the evening by a large crowd. There's some amount of hometown pride, of course, especially for a filmmaker who has continued to live in the area and even shows up frequently at Sixers games. But a lot of it also has to do with Shyamalan making nearly all of his movies, as well as his upcoming Apple show Crumpet, in or near Philadelphia, even at a time when tax incentives are pushing many filmmakers elsewhere. Glass opens Friday at theaters throughout the Philadelphia region.